I used to be afraid of death. I didn’t know it. But looking back, it was the underlying fear of all of my fears. My journey to freedom was long and gradual. I was raised with a lot of love and acceptance. That helped me to “claim my voice” and speak out at a young age. When I was ten years old, I voiced my first big decision. My parents had enrolled me in a Hebrew school that I attended four days a week after public school. At recess one day, I ran one block to my home, crying, and told my mother that I wouldn’t return to the Hebrew school that day and that I wouldn’t ever return again. I never returned. Fortunately, my parents respected my decision. At fourteen, I was enrolled at the high school that had the highest academic achievement in Los Angeles. A couple of weeks before I started high school, with my older brother’s influence, I changed my mind and enrolled in a high school that was more diverse but did not have the same high academic standing. I felt I would get a better overall education because this school was integrated racially and ethnically. Soon after I started this new high school, I joined a female social club. I was called a new “pledge.” It didn’t take me long to recognize that all the social clubs in the school were segregated by ethnicity, and some were even segregated by religion. This seemed wrong to me, and I didn’t want to be part of it. I persuaded the other “pledges” to go to the president of the club and quit. We all did this. This was another time I claimed my voice as a young person. I went to U.C. Berkley in 1963 when I was only sixteen years old. It was during the Free Speech Movement. Just by being in this environment, I began to join thousands of other young people who were claiming their voices collectively. Being so young, it was overwhelming to me to be in the middle of a social movement that sometimes became violent. Nevertheless, my eyes and ears were open, and I was deeply influenced by my environment and the issues that were being expressed. My parents were Jewish and first generation Americans. They were two generations older than me. I was the youngest of four children. My father worked all the time to support us. My mother showered me with love, but she didn’t have the experience to give me guidance. I began to make my own decisions and mostly raised myself from the age of fourteen. When I graduated from the University, I soon moved into an integrated, intentional community. Residents were people from all walks of life, all educational levels, all professions, all colors and creed. My happiest childhood memories had been from month long summer camps and being in community. This intentional community reminded me of those wonderful summers. I also wasn’t ready to live on my own as a young adult in the world. This community was inviting and a place for me to land when I was twenty-one years old and fresh out of college. I was born at a time when women usually became teachers, social workers or nurses. I became a fine math teacher. But then I broke out of that mold and I learned business/sales/marketing and consulting skills. I had the aptitude for business and loved it and was very good at it. I gave birth to a wonderful daughter (who now lives in Belgium) who has given me two special grandchildren. I didn’t stay married to my first husband. A few shorter relationships followed, and then entered a relationship with Alan that lasted the next twenty-six years. I was forty and Alan was fifty years old when we became a couple. Although I never said “‘til death do us part,” I knew this was the kind of relationship we had. And that is what occurred. 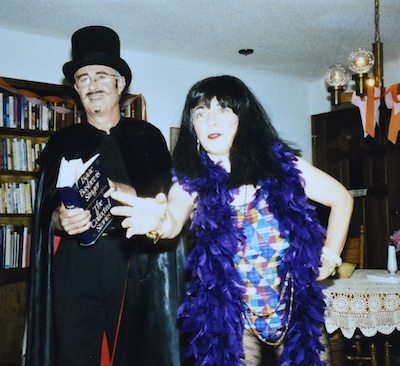 We partnered in most everything – in our business and technology consulting partnership that focused on the legal profession; giving continuing legal education seminars to attorneys; taking care of my mother who lived with us for the last eleven years of her life; playing improvisational jazz piano in our home on two side-by-side pianos; developing and performing storytelling and magic shows that honored people’s lives and more. We were best friends. We supported each other to each become the best human beings possible.